Apoch’s Metal Review and Greyhaze Records present the exclusive premiere of MYSTIFIER‘s “An Elizabethan Devil-Worshiper’s Prayer Book.” The track comes off the Greyhaze Records deluxe CD/DVD digipak reissue of Wicca, the now classic debut from this highly influential Brazilian black metal band. Stream the track now at this location. Wicca, the debut album from influential Brazilian Black Metal act MYSTIFIER. Release dates are February 18 for the U.S. and February 24 for Europe. Wicca was originally released in the early 90s and has seen a few reissues by labels worldwide. However, for many years, the album has been out of print. The audio portion of this release will feature, aside from the full album, bonus tracks not before available in any previous version. The DVD will contain two concerts by the band: One performed in Germany during the Nuclear War Now Festival and the other performed in their hometown of Salvador, Brazil. Visually, the digipak will feature a new graphics layout as well as old photos from the band. A vinyl version of the album is also to follow. 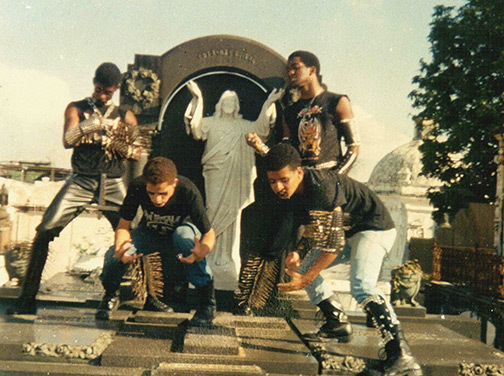 Mystifier has been active for over 20 years and, alongside bands such as Blasphemy and Beherit, were pioneers of Black Metal in the early 90’s. Their style can be described as savage, unapologetic and utterly satanic Black Metal drawing influence from Masters of the genre such as Sarcofago, Bathory, Vulcano, and early Sepultura. For press inquiries and interview opportunities, get in touch at ClawhammerPR@gmail.com.